Sadly, I’ve watched many centralized change teams (e.g., Lean Offices, Agile Groups, Morale Committees) die organizational deaths. Much of the suffering prior to their demises has been at their own hands, though I doubt they would ever see it that way. Hence, I offer my perspective as another version of the story that may prompt self-reflection and learning. I’ll focus on three main ways that a change team dies, which include coercion, lag time and a focus on self. Afterwards, I will offer a potential solution of implementing employee empowerment, while minimizing business risk. They drive people. When you use some form of coercion (e.g., orders, fear of negative consequences, removal or application of positive consequences) to compel others to change, you are draining away from them and yourself some amount of energy. This slow-but-steady drain eventually depletes either the change team or their victims (er, clients). This drain usually goes unnoticed until a leader of one of the client organizations takes action to force a senior leader above the change team to cancel their work. Many meetings are held to question what, if any, value the change team is providing. Eventually, the senior leader gives in, saddened by the situation, but powerless to disagree. A central change team can save itself by switching to driving change, choosing this change (obviously) and clearing the obstacles for others to choose it to. By removing themselves from driving people, they will have removed a huge obstacle for their clients. They lag behind the clients they purport to serve. When a central change group is created, the presumption is that they are the thought-leading, practice-leading experts who can, with their full time devoted to the change work, pull the entire organization along on their knowledge and experience. Yet, many central change teams may start out ahead of some of their clients, but usually aren’t out ahead of all them. Swelled with the pride of their new organization, the change teams can fall into a trap of arrogance, and disconnect from the thought and practice-leading clients and begin to create “the standard” way of doing the work, which is often more theoretical than practical, and often lags the learning that the clients are doing in the field. As time progresses, the gap between the leaders and the central organization grows, as the leaders are still driving for results and the central is driving for scalable, controllable models (one size training, one process implementations). When the gap gets big enough, or the tug of their lagging standard gets big enough, the leaders will again appeal to the senior leaders to choose between the results they are getting for the organization or the overhead of the centralized team, which failed to help the leading group get any better, faster, or cheaper. A central team can save itself if it rediscovers its humility and links itself to the leaders in a driving change way of obstacle removal and pushing out the edges of organizational limits. They focus on their program, versus on their clients or their results. When I ask a central change team, what are you working on, and all they tell me is about internal meetings, internal plans, and internal processes, I know they are slowly dying. Their attention has shifted from their clients and client results to themselves and their results (or activities often) and with this shift they have lost the focus they need to deliver on the reason they were created: results. They can save themselves if they shift their time together to figuring out how they can faster support their clients and remove the obstacles their clients have identified or ratified. There are many great people in the world doing their very best to drive implementations of worthy changes and methods, however they continue to coerce, lag on their commitments and focus on self. All of these problems are related to the business struggle with how to enact empowerment on their projects. Utilizing a simple framework to help have an effective conversation about how to integrate empowerment with development and teamwork can curb many of the above problems. For some business professionals this can be known as tollgates or clip rates. Usually used when it comes to finances, there are budgetary limits set for decision making that an individual can do on their own before they require authorization. Once the budgetary limit goes over that amount, there must be additional authorizations provided to make the decision. 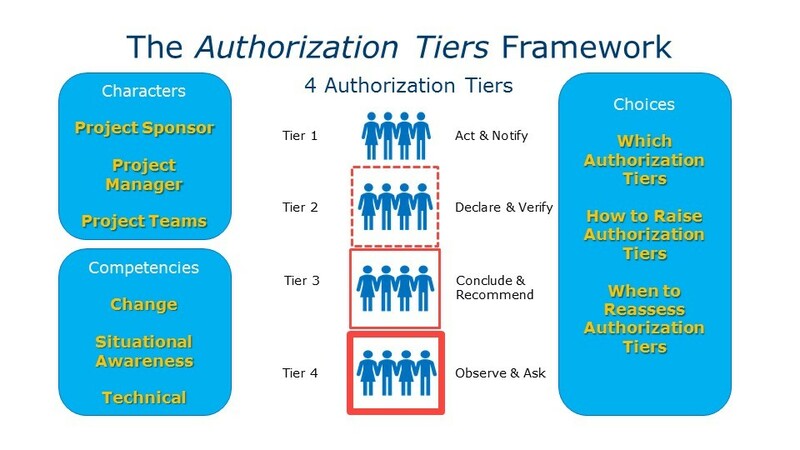 Another simple solution is referred to as the Authorization Tiers Framework (see image below). Merging my work and David Marquet’s Ladder of Leadership, the Authorization Tiers Framework debuted publicly at the New Trends in Project Management (NTPM) Conference for Project Management Institute (PMI) in Gdansk, Poland. I keynoted on April 25, 2017 and shared how anyone can use the authorization tiers to increase their opportunity to thrive in complex environments. For the full presentation slides click here. Maximizing employee empowerment can be difficult because it puts the business at risk, but no business can afford to micromanage all of their employees. I hope that by identifying the will help you see ways they can avoid common problems and keep themselves serving their clients well for years to come. By using the Authorization Tiers Framework, you may generate the employee empowerment that your employees have always hoped for. April’s book, Everyone is a Change Agent, is available on Amazon. 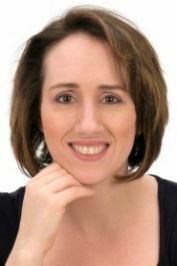 April K. Mills is an author and speaker. At her blog, Engine-for-Change.com, she shares her passion for creating positive change, outlining ways that anyone can drive change for themselves, their organizations, and their communities. She partners with organizations and individuals to help them drive the changes they want to see in the world.